The National Institutes of Health would stop processing grants, but astronauts in space would keep working. The clock is ticking for US lawmakers, who have fewer than two days — as of 18 January — to pass a new budget, or they will trigger a government shutdown. Nature explains why politicians are struggling to reach a deal, what is at stake for science and whether a crisis can be avoided. Because Congress failed to negotiate a spending plan for the full 2018 budget year, which began on 1 October 2017, the US government is operating under a temporary funding measure. It expires on 19 January. One major sticking point is an immigration programme called Deferred Action for Childhood Arrivals. It shields nearly 800,000 people from deportation, all of whom were brought to the United States illegally as children. US President Donald Trump announced in September that he would phase out the programme beginning in 2018. Many Democrats in Congress want to include protections for DACA participants — called Dreamers — in any budget deal, whereas Republicans oppose such a plan. What are the chances that a shutdown can be averted? It's hard to say, because negotiations over the US budget often come down to the wire. In April 2011, for example, Congress and the White House reached a deal less than two hours before a shutdown would have begun. Lawmakers have been considering various temporary fixes, such as a House bill that would fund the government until 16 February. This type of deal could give politicians more time to hammer out a final plan for the remainder of the 2018 budget year, which ends on 30 September 2018. But passing another stopgap measure could also leave the government vulnerable to a shutdown later this year. Are government agencies preparing for closure? Federal law allows agencies to keep some workers on the job if their duties are deemed necessary to protect life and property — such as the US Geological Survey's on-duty seismologists in Golden, Colorado, who monitor earthquakes worldwide to produce real-time analysis and damage estimates. There are also exceptions for the military, law enforcement and some health-care positions. The numbers of these essential employees vary by agency. How would a shutdown affect science? The effects would vary with the length of the closure and by agency. Some are widespread: for instance, government employees would be barred from attending scientific conferences or meetings during a shutdown. Other clues can be gleaned from agencies’ experiences during the 16-day shutdown in October 2013 (see our complete, archived coverage), their current shutdown plans and reporting by Nature’s US news staff. Okay, so what about the US National Institutes of Health (NIH)? In 2013, 80% of the biomedical-research agency’s 19,740 employees were placed on enforced leave. The NIH rescheduled the review of more than 13,700 grant applications, according to a report by the Government Accountability Office (GAO). Clinical studies at the NIH campus in Bethesda, Maryland, continued, but new patients were initially turned away from enrolling in trials. Some technicians remained to care for roughly 1.4 million rodents and 3,900 non-human primates. The agency’s current shutdown plan, dated October 2016, calls for 602 employees to remain on duty to care for animals and other property, 586 to “protect ongoing medical experiments” and 2,223 to provide medical services to patients at the NIH Clinical Center. But the agency would not admit new patients unless NIH Director Francis Collins deems that medically necessary. And all action on grant applications or awards would cease. All operating space missions would continue to function normally and gather data, as would the International Space Station. The three US astronauts aboard the station would continue working; two are scheduled to return to Earth in February. Cargo flights to resupply the station would continue as normal. But it is less clear how a shutdown would affect some high-profile spacecraft that are being prepared for launch. 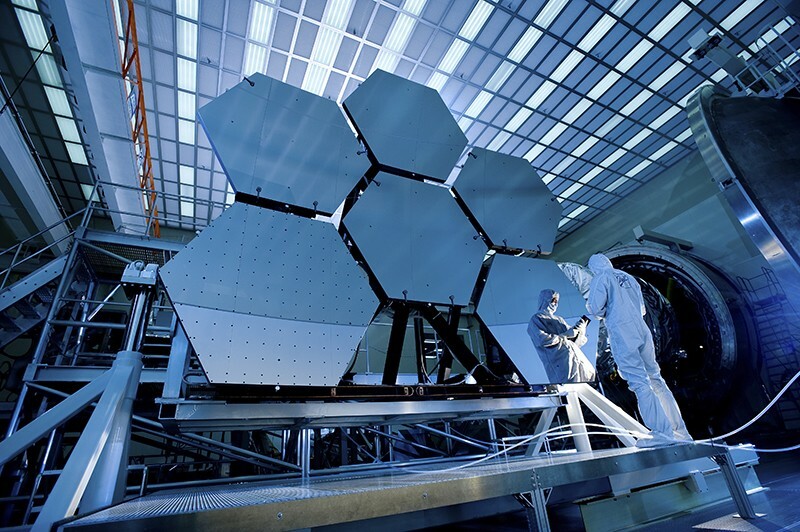 The James Webb Space Telescope is at NASA’s Johnson Space Center in Houston, Texas, where it spent much of last year undergoing tests in a cold chamber that mimics the environment in deep space. The telescope, which is set to launch in 2019, must complete one final practice deployment of its sunshield before it is shipped to California for final integration and testing. Should the government shut down, the Houston centre would close and work on the telescope would halt. When it comes to preparing spacecraft for launch, NASA’s shutdown plan makes exceptions only for those necessary to prevent harm to life or property. The situation would probably be different for the Transiting Exoplanet Survey Satellite, which is slated to launch no earlier than March. The aerospace company Orbital ATK is working on the spacecraft at its facility in Dulles, Virginia. NASA contractors generally continue their work on agency projects during a shutdown, as long as they have enough money from the space agency to proceed — and as long as government employees are not involved. ... the National Science Foundation (NSF)? More than 98% of the agency's roughly 2,000 employees would be sent home during a shutdown, if 2013 is taken as a guide. The agency would stop reviewing grants or issuing payments. After the 2013 shutdown ended, for instance, the agency rescheduled the due dates for proposals to roughly 50 programmes. The last shutdown also interrupted the annual field season of the agency's Antarctic research programme. At first, the programme was allowed to continue operating to ensure the safety of NSF staff, researchers and contractors at three Antarctic research stations. But the agency was eventually forced to put those bases into 'caretaker' status, halt research and begin evacuating personnel as funding dwindled. A government shutdown now would begin during the tail end of the Antarctic summer field season, which normally runs from October to February. That could minimize the damage to scientific research. ... the Department of Energy (DOE)? The department’s national laboratories would continue to function normally for some period of time because they are run by contractors who receive periodic payments from the DOE to fund operations. During the 2013 shutdown, the national labs never actually closed — although they would have if the funding freeze had lasted just a few days longer. Roughly 5,300 of the agency’s 11,400 employees would stay on the job, with many supporting the work of the National Weather Service. Most other scientists will be sent home, but there are exceptions: a skeleton crew would ensure that NOAA’s greenhouse-gas monitoring stations continue to collect data. The agency maintains an extensive fleet of research vessels, and most of these would be directed to return to the nearest port. About 55% of the agency's employees would stay on the job. FDA scientists would discontinue most research, but drug reviews would continue because these activities are funded by fees from the pharmaceutical industry. Would a shutdown save money? Probably not, judging by what happened in 2013. The GAO reports that 850,000 government employees — roughly 40% of the federal workforce — were “furloughed”, or ordered to stay home without pay. But Congress eventually approved about US$2 billion in retroactive compensation for these workers, erasing any payroll savings. More broadly, a report released in November 2013 by the administration of former president Barack Obama concluded that the shutdown had led to 6.6-million lost work days for civilian federal employees, and might have prevented the creation of up to 120,000 private-sector jobs. How many times has the federal government shut down, anyway? More than you might think — at least in recent decades. The US Congressional Research Service says that there have been 18 shutdowns since 1976. Five of those occurred between 1977 and 1980, as then-President Jimmy Carter fought with Congress over federal funding for abortion. At 16 days, the 2013 shutdown wasn't the longest in US history. That honour belongs to a 21-day closure that began on 16 December 1995, after a temporary funding measure expired. With reporting by Heidi Ledford, Sara Reardon, Jeff Tollefson and Alexandra Witze.